After leaving his native Tampa to become a Hurricane, Woody Austin would leave his mark as one of the greatest golfers in U.M. history. A product of Chamberlain High, where he placed 2nd in the 1982 Jr. Orange Bowl Tournament, Woody combined length off the tee with excellent ball-striking ability to record the lowest tournament average in all four years at Miami. His finest year may have been his Junior season of 1984, when he was medalist at the Florida Intercollegiate Championships held at Sebring Country Club, bringing home the title with a three round score of 217. Later that year, he teamed with fellow Cane Ronnie McCann to win the 1984 Bluebonnet Bowl Invitational Two-man, Best Ball Tournament in Houston. Woody toured Japan and was named MVP of the USA-Japan All-Star Matches, which he won by 10 shots with a tournament record score of 13 under par 203! He recorded 9 Top Ten finishes for the year and placed 9th at the NCAA Championships. He also set a course record of 57 at the Babe Zaharias Golf Course in Tampa, and was a semi-finalist at the USGA Public Links Championship. In 1985, 'The Woodman", as he was known to teammates, would finish 2nd at the Southeastern Invitational, the Florida Southern Invitational and the Imperial Lakes Classic, where he recorded his lowest competitive score of 65. He led Miami to the Florida Intercollegiate Championships Team Title with a one-stroke victory over the Florida Gators. For his career, he recorded 19 Top Ten finishes, was twice named Honorable Mention All-American and placed 3rd Team All-American his Junior year. He would serve as a team tri-captain during his Junior and Senior seasons. 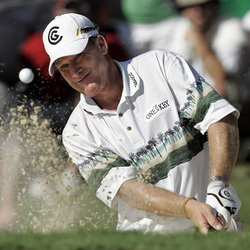 After graduating in 1986 with a degree in Business Administration, Woody made his Big Break in golf when he won the 1994 PGA Qualifying School, going on to win 1995 PGA Tour Rookie of the Year honors, along with his first pro victory, the 1995 Buick Open. He also won the 2004 Buick Open. Last year Woody had his best year on tour with his 3rd victory at the Stanford St. Jude Championship, shooting a final round 62, his 2nd Place finish at the PGA Championships, along with his clutch putting performance on the winning U.S. President's Cup team. Woody, along with wife Shannon, and sons, Parker and Peyton, make their home in Derby, Kansas.